The official dedication ceremonies for the newly built Mackinac Bridge began with the first "Governor's Walk" across the bridge, lde by Governor Soapy Williams. Oldsmobile also provided a fleet of convertibles so that beauty queens from all over Michigan could participate. The first few of the 103 white 1958 Oldsmobile Convertibles at the beginning of the parade along Mackinaw City's Central Avenue. 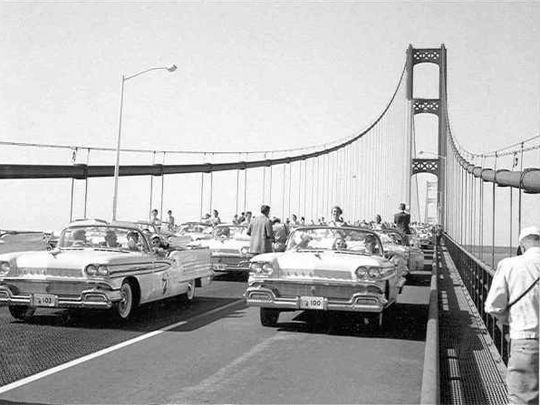 The International Walkers Association organized the first bridge walk on June 25, 1958 — from Mackinaw City to St. Ignace. Some 60 people hoofed it, including Gov. G. Mennen (Soapy) Williams, according to “Mackinac Bridge: A 50-year Chronicle, 1957-2007” by Mike Fornes. In 1959, the walk moved to Labor Day, and participation swelled. The route’s direction alternated until 1964, when it permanently became north to south. An average of 50,000 people participate annually. For the full article, see Martha Thierry, "Labor Day Mackinac Bridgewalk", Detroit Free Press, August 29, 2013. Michigan Historical Calendar, Clarke Historical Library at Central Michigan University.